The first phase of The Venus Project’s long-term plans has already been completed. 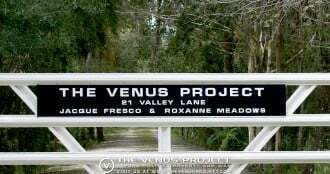 Jacque Fresco, futurist, inventor, industrial designer and founder of The Venus Project and his associate Roxanne Meadows have completed the construction of a 21-acre research center in Venus, Florida to help present the proposals of The Venus Project. Videos, CDs and DVDs, posters, brochures, models, renderings and books, such as The Best That Money Can’t Buy: Beyond Politics, Poverty, & War, have been created to help raise awareness about this project and its many proposals. Phase Two includes the production of documentaries to help introduce this direction to the world. Two major documentaries have already been completed: Paradise or Oblivion and The Choice is Ours. Phase Two also includes a full-length feature film that will depict how a world embracing the proposals advanced by The Venus Project would work. This film would provide a positive vision of a peaceful society in which all human beings form a global family on planet Earth. A civilization in which all people are engaged in the pursuit of a better understanding of the world they share. This film has been designed to be an entertaining and educational experience for both adults and children. Realizing the declaration of the world’s resources as being the common heritage of all people. Transcending the artificial boundaries that currently and arbitrarily separate people. Replacing money-based nationalistic economies with a resource-based world economy. Assisting in stabilizing the world’s population through education and voluntary birth control. Redesigning cities, transportation systems, agricultural industries, and industrial plants so that they are energy efficient, clean, and able to conveniently serve the needs of all people. Gradually outgrowing corporate entities and governments, (local, national, or supra-national) as means of social management. Sharing and applying new technologies for the benefit of all nations. Developing and using clean renewable energy sources. Manufacturing the highest quality products for the benefit of the world’s people. Requiring environmental impact studies prior to construction of any mega projects. Outgrowing nationalism, bigotry, and prejudice through education. Eliminating elitism, technical or otherwise. Enhancing communication in schools so that our language is relevant to the physical conditions of the world. Providing not only the necessities of life, but also offering challenges that stimulate the mind while emphasizing individuality rather than uniformity. Finally, preparing people intellectually and emotionally for the changes and challenges that lie ahead. Within the experimental city, a theme park is also planned that will both entertain and inform visitors about the possibilities for humane and environmentally friendly life-styles planned by The Venus Project. It will feature intelligent houses; high-efficiency, non polluting transportation systems; advanced computer technology; and a number of other innovations that can add value to the lives of all people – in a very short period of time. A circular city would be a transitional phase and could evolve from a semi-cooperative money-oriented society to a resource based economy. This could be the prototype for a series of cities to be constructed in various places throughout the world. The rate of progress will depend on the availability of funds raised during the early stages and the people who identify with , participate in, and support the aims and direction of The Venus Project. No one can actually predict the future. We can only extrapolate on present information and trends. Population growth, technological change, worldwide environmental conditions, and available resources are the primary criteria for future projections. There is no single philosophy or point of view whether religious, political, scientific, or ideological, that someone would not take issue with. We feel certain, however, that the only aspects of The Venus Project that may appear threatening are those which others project onto it. The Venus Project is neither Utopian nor Orwellian, nor does it reflect the dreams of impractical idealists. Instead, it presents attainable goals requiring only the intelligent application of what we already know. The only limitations are those which we impose upon ourselves.